I previously reported about Google's search experiments, but I intentionally left out a very interesting addition: the info view, a part of the search visualization experiments. This new option replaces the traditional snippets with other information that could be more interesting to you. The data is extracted from the web pages and it's displayed consistently for all the results. Tip: To see this new view, just add view:info to your Google query. 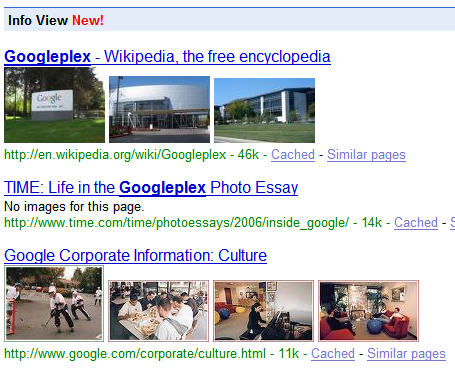 Let's view the images from the top results for [Googleplex]. This helps you understand visually if the page is relevant to you and see what it's all about. 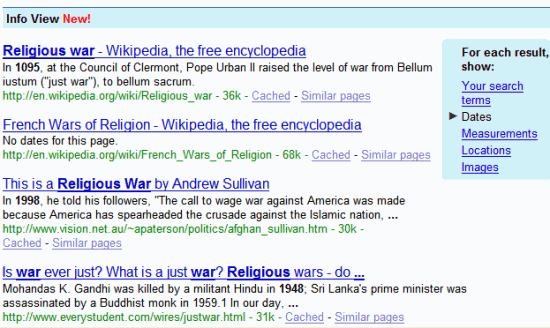 If you research information about religious wars, it's useful to know the dates for the events described in Google's search results. Google highlights them in the snippets. The measurement view could be useful to highlight the specs of a gadget, while the location view shows you the places mentioned in a web page and it's helpful to discover the relation between your query and some locations. The time view and the location view have alternate interfaces, but they only show a small number of web pages. Google has already improved the snippets using Plus Boxes and these new views could generate other Plus Boxes or different ways to view the search results, depending on your queries ([places to visit in Paris] could show a map, while [Muse concert dates in Europe] would show an automatically-generated timeline).